Physical characteristics: The American white pelican, with its big wings and immense bill, is one of the largest waterbirds in the world. These pelicans are mostly white with yellow-gray crests and black wingtips. During breeding season, both male and female develop a knob on their orange bills. The birds are about 62 inches (157 centimeters) long and weigh an average of about 16.4 pounds (7.4 kilograms). Geographic range: American white pelicans live mostly in the western and southern parts of North America from Canada to Mexico. Habitat: In spring, American white pelicans breed mainly on islands in freshwater lakes. They often feed in marshes, rivers, and shallow lakes that are as far as 30 miles (48 kilometers) from the nesting colony. Most of them migrate to warm seashores in fall. Diet: Flocks of American white pelicans often fish together. They usually sit on the water and dip their bills in to catch fish. They occasionally also eat crayfish and salamanders. Behavior and reproduction: Despite being large, heavy birds, flocks of American white pelicans often soar very high. Their courtship usually starts with dozens of birds flying over a nesting area. The females generally lay two eggs in nests on the ground, and the parents take turns sitting on the eggs for about a month. The chicks walk away from their nests long before they can fly. They gather in noisy bunches, while their parents fly back and forth with food. The parents regurgitate food and the young pelicans eat from their pouches. 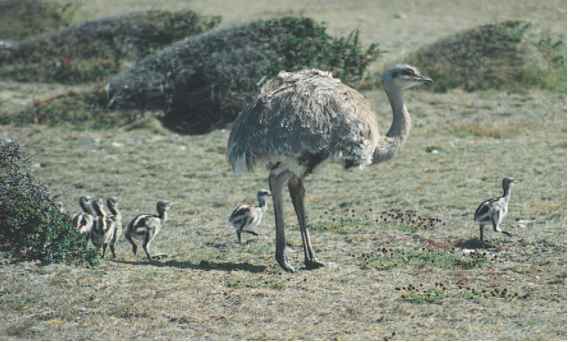 At about three months, the young birds are on their own. American white pelicans and people: American white pelicans do not like to have people near their nesting colonies, and they may desert their nests if people come near. Motorboats and low-flying airplanes also disturb them. Although the pelicans usually eat the kinds of fish that people don't want, sometimes people shoot them because they think the birds are stealing valuable fish. Johnsgard, Paul A. Cormorants, Darters, and Pelicans of the World. Washington, DC and London: Smithsonian Institution, 1993. Stuart, Chris and Tilde. Birds of Africa from Seabirds to Seed-Eaters. Cambridge, MA: The MIT Press, 1999. Daerr, Elizabeth G. "A Pelican's Progress." National Parks (April-May 2002): 30.
de Roy, Tui. "To Swim with Pelicans." International Wildlife (January-February 1995): 4-11. Duckworth, Carolyn. "It's Ralph to the Rescue." Ranger Rick (September 1990): 12-16. Ehman, Amy Jo. "Pelican Brief." Canadian Geographic (March/April 2001): 28-32. Evans, Roger M., and Fritz L. Knopf. "The Birds of North America, American White Pelican, No. 57." The American Ornithologists Union and The Academy of Natural Sciences (1993): 1-24. Fontenot, Bill. "TLC for Pelicans in Louisiana." Wildlife Conservation (July-August 2000): 16. LePelley, Richard. "Two Hungry Fishermen, One Tangled Mess." Christian Science Monitor (June 6, 2001): 22, Op, 1c. Miller, Claire. "Super Scoopers." Ranger Rick (July 1999): 6-12. Ross, John F. "Where the Wild Things Are." (Pelican Island Refuge) Smithsonian (March 2003): 66-75. University of Maryland. "Where the Birds Are, Flight Patterns of Pelicans." National Wildlife (February/March 2000): 12. Fawkes, Ryan. "American White Pelican." Animal Diversity Web. http://animaldiversity.ummz.umich.edu/site/accounts/information/ Pelecanus_erythrorhynchos.html (accessed on April 16, 2004). Steet, Robin. "Pelecanus occidentalis (Brown Pelican)." Animal Diversity Web. http://animaldiversity.ummz.umich.edu/site/accounts/ information/Pelecanus_occidentalis.html (accessed on April 16, 2004). Environmental Conservation Online Services. "Pelican, Brown." U.S. Fish & Wildlife Service. http://ecos.fws.gov/species_profile/ SpeciesProfile?spcode=B02L#status (accessed on April 17, 2004).